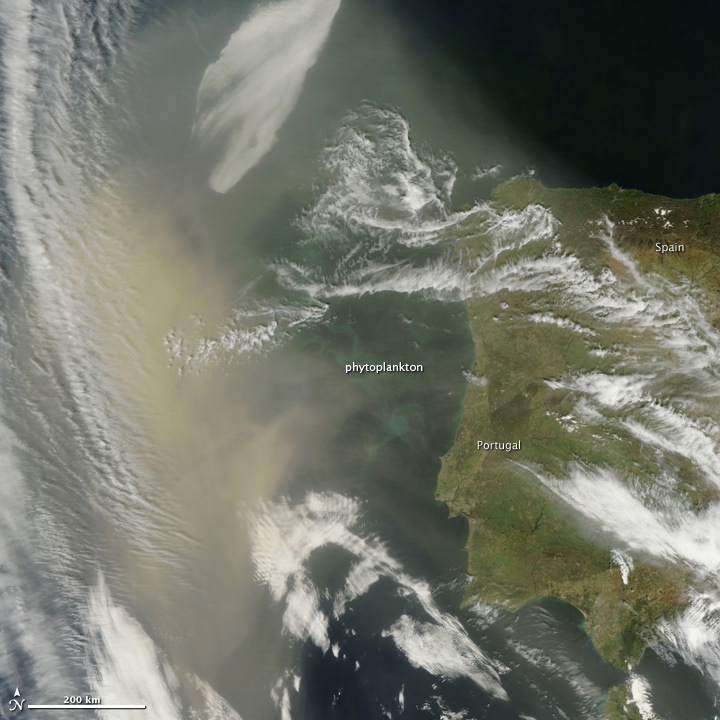 A thick plume of dust hangs over the Atlantic Ocean off the coast of Portugal in this image from the Moderate Resolution Imaging Spectroradiometer (MODIS) on NASA’s Terra satellite on April 6, 2011. The dust blew in from the Sahara desert in North Africa, picked up by the strong winds associated with a low-pressure system. The tell-tale circular cloud pattern of the low-pressure system was visible in an Aqua MODIS image from the previous day. The low-pressure system channeled the dust west and then north, resulting in the plume off Portugal. The animation (link above) from the GEOS-5 model at NASA’s Goddard Space Flight Center shows the evolution of the dust plume between April 4 and April 9. Based on forecast weather conditions, the model predicted patterns that are similar to those shown in the MODIS image. Airborne dust plays many roles in large-scale Earth processes. Dust is one of the most abundant aerosol particles in the atmosphere, and a natural seed for cloud formation. Dust particles and the clouds they generate can reflect energy from the Sun back into space, effectively shading Earth’s surface and cooling its temperature. Dust also carries minerals, particularly iron, that help fertilize the Earth’s oceans. In iron-poor waters, dust provides essential nutrients for phytoplankton, tiny plants and plant-like organisms growing in the sunlit surface waters. 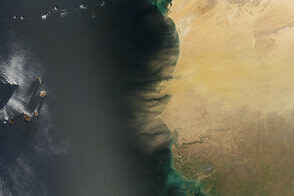 In fact, a phytoplankton bloom colors the Atlantic beneath the dust in this image, though there is not necessarily a connection between the dust storm and this particular bloom. NASA image courtesy Jeff Schmaltz, MODIS Rapid Response Team at NASA GSFC. Animation from the Global Modeling and Assimilation Office GEOS-5 aerosol forecast. Caption by Holli Riebeek. 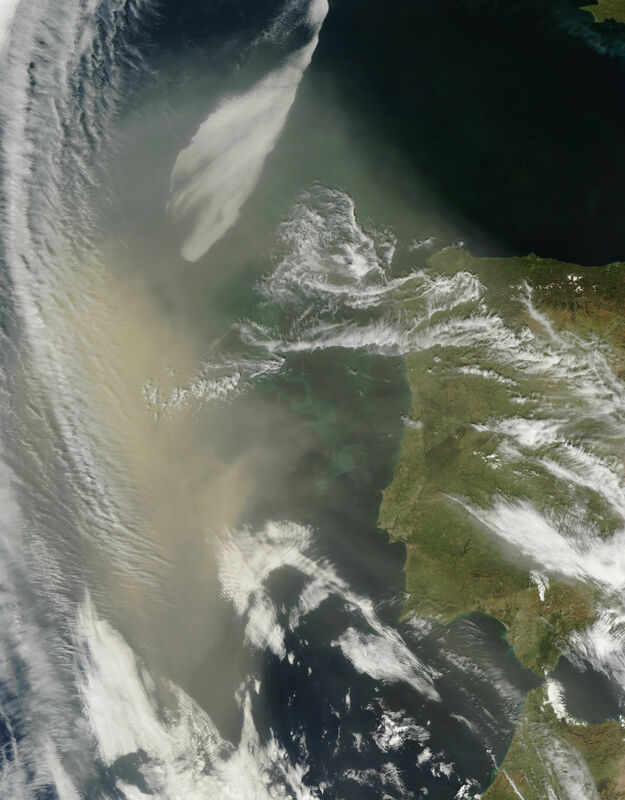 A thick plume of tan dust hangs over the Atlantic Ocean off the coast of Portugal in this image taken on April 6, 2011. 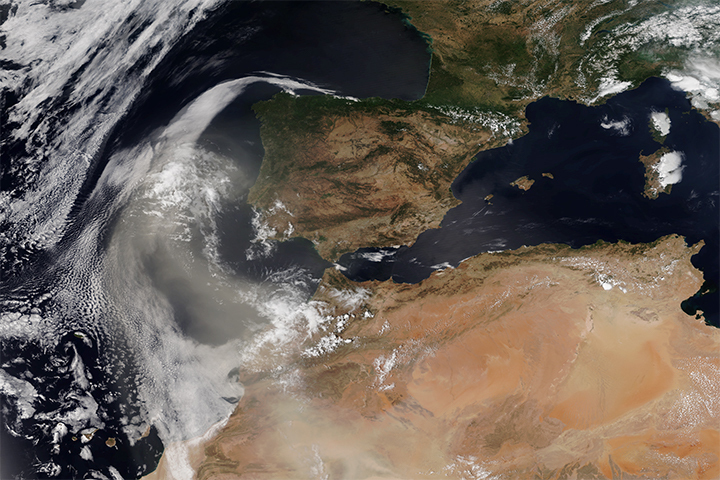 A dense plume of Saharan dust swept north off the coast of Portugal in a spring storm on April 6, 2011.